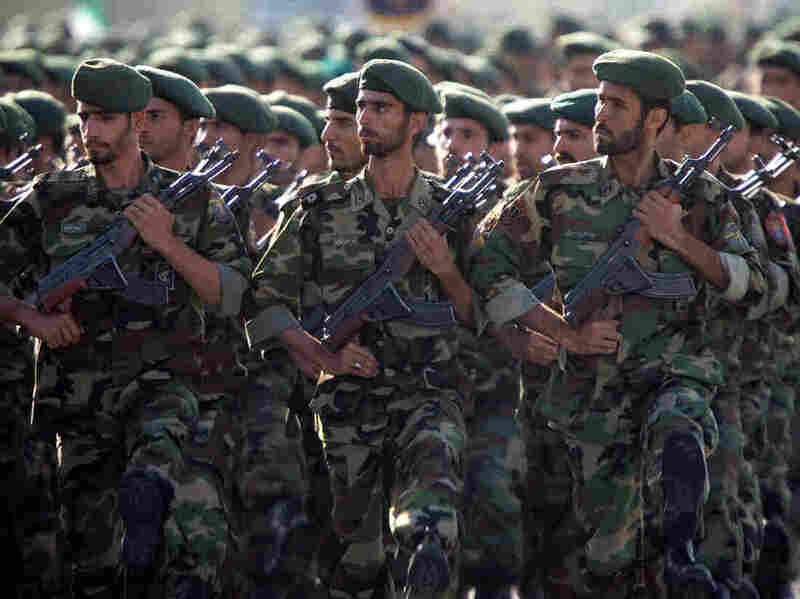 U.S. Labels Iran's Revolutionary Guard As A Foreign Terrorist Organization Iranian officials say they're prepared to retaliate in kind, warning that the elite Revolutionary Guard could now view U.S. troops the same way it sees ISIS. The U.S. has designated Iran's Revolutionary Guard Corps as a terrorist group. Here, members of the force march during a 2007 military parade in Tehran. The Trump administration is designating Iran's Islamic Revolutionary Guard Corps as a foreign terrorist organization, taking an unprecedented step as it seeks to increase pressure on Iran's regime. The move seems certain to bring a new level of tension between the two countries, as Iran's leaders have said they will retaliate in kind. Iranian lawmakers have prepared legislation that would label part of the U.S. military as a terrorist group, according to Iran's state-run IRNA news agency. President Trump announced the designation Monday morning, in a shift from the decades in which the U.S. has viewed Iran as a state sponsor of terrorism. "This unprecedented step, led by the Department of State, recognizes the reality that Iran is not only a State Sponsor of Terrorism, but that the IRGC actively participates in, finances, and promotes terrorism as a tool of statecraft," Trump said in a White House statement. "The IRGC is the Iranian government's primary means of directing and implementing its global terrorist campaign." In response, Iran's Foreign Minister Mohammad Javad Zarif urged his government to add the Pentagon's U.S. Central Command to its own list of terrorist organizations, IRNA reports. With the U.S. designation, anyone who deals with the Revolutionary Guard could run the risk of facing criminal charges, such as aiding or supporting a terrorist group. "If you are doing business with the IRGC, you will be bankrolling terrorism," Trump said. It's the first time the U.S. has declared an element of a foreign government to be a terrorist organization, the Trump administration says. The Revolutionary Guard now joins ISIS, Boko Haram and other groups on the U.S. list of terrorist groups. Laying out the administration's reasoning for the designation, Secretary of State Mike Pompeo listed a string of attacks and violent plots, which he said gave "ample justification for today's decision." Among the cases cited by Pompeo were two that directly involved the U.S.: the 1996 Khobar Towers apartment complex bombing in Saudi Arabia, which killed 19 American service members and wounded dozens more; and a 2011 case in which the Obama administration said it had foiled a Quds Force plot to kill the Saudi ambassador to the U.S. in a bombing in Washington, D.C.
Today, the White House sees the IRGC as an "active and enthusiastic participant in acts of terror," a senior administration official said in a background briefing held shortly before Pompeo discussed the announcement Monday morning. Accusing Iran of using the Revolutionary Guard to try to reshape the Middle East in its favor, another official said the group has amassed too much power and money, which he said it then uses to support attacks on Americans and U.S. assets. "The Middle East cannot be more stable and peaceful without a weakened IRGC," the official said. In recent months, the Trump administration has sought to impose "maximum pressure" on Iran's regime, after abandoning the nuclear deal brokered during the Obama administration. Even before news emerged of a possible terrorism designation for the Revolutionary Guard, more than 970 Iranian entities and individuals were already under U.S. sanctions. But the administration is now taking the rare step of designating another country's military force as a terrorist group. "In the past, part of the Guard Corps, known as the Quds Force, has been targeted by Washington," NPR's Peter Kenyon reports. "Iran's Foreign Minister Mohammad Javad Zarif tweeted that President Trump 'should know better than to be conned into another U.S. disaster.' "
Zarif and other Iranian officials sharply criticized the U.S. plan over the weekend, after news emerged that an official U.S. announcement against the Revolutionary Guard was imminent. Maj. Gen. Mohammad Ali Jafari, the commander of Iran's Revolutionary Guard Corps, warned that if the U.S. labels his force as a terrorist group, the result would mean the Revolutionary Guard could target the U.S. military the same way it currently targets ISIS. "If (the Americans) make such a stupid move, the U.S. Army and American security forces stationed in West Asia [Middle East] will lose their current status of ease and serenity," Jafari said, according to the semi-official FARS News Agency. "I do not think that the Americans will be that much out of their mind to designate the IRGC as a terrorist organization," Iranian Parliament Speaker Ali Larijani said, according to FARS. The U.S. designation of the Revolutionary Guard comes one day before Israel holds a national vote on the leadership of Prime Minister Benjamin Netanyahu. Responding to news of the pending announcement, Zarif said Trump is granting a long-held request from Netanyahu. Netanyahu welcomed the move once it became official Monday, calling Trump a "dear friend" and thanking the president for his decision. "Once again you are keeping the world safe from Iran aggression and terrorism," Netanyahu said via Twitter. When asked about the timing of the designation on Monday, senior Trump administration officials said it had been in the works for months. They also said that in the past, there has been bipartisan U.S. support for declaring the Revolutionary Guard a terrorist group. As Pompeo described the Trump administration's rationale for making the terrorist designation, he said the Revolutionary Guard now plays a large role in Iran's economy, "through pure kleptocracy." The U.S. has previously targeted the Revolutionary Guard's investment arm — the IRGC Cooperative Foundation, or Bonyad Taavon Sepah — with the Treasury Department saying in 2010 that military leaders were using the organization to exert control over Iran's defense production, construction, and oil and gas sectors. On Monday, Pompeo noted that last July, officials in Tehran said the Revolutionary Guard's foundation had "embezzled more than $1 billion from the city" and that Tehran's mayor, a former guard commander, has been accused of "steering contracts to the IRGC." "The leaders of Iran are racketeers, not revolutionaries," Pompeo said. Administration officials also reiterated allegations against Iran that were made last week, when the State Department's Brian Hook, U.S. special representative for Iran, blamed Iran for the deaths of hundreds of American service personnel in Iraq. "Iran is responsible for the deaths of at least 608 American service members" in Iraq, Hook said, citing U.S. military reports. When he announced that figure, Hook did not give many details about those deaths; on Monday, he said the U.S. personnel had been killed by improvised explosive devices that Iran supplied to militias in Iraq. "This accounts for 17 percent of all deaths of U.S. personnel in Iraq from 2003 to 2011," Hook said last week. "This death toll is in addition to the many thousands of Iraqis killed by the IRGC's proxies." Hook also accused Iran of causing widespread problems, saying it supports the Hezbollah in Lebanon and Palestinian groups such as Hamas, and backs the Houthi military insurgency in Yemen, where Iran has been engaged in a proxy war with Saudi Arabia. NPR's Michele Kelemen contributed to this report.